tsulin + +: Spring : Season of fun! Spring : Season of fun! Two reasons why we decided to head out to the park last Saturday! Glorious sun (not gonna last as I just checked and starting tomorrow for the next 4 days there are rain clouds! ), perfect for spending the day outdoors. After lunch, Meng drove us to a new park - somewhere we've not been to, a park at South of the River Thames. She, obviously enjoying basking in the sun, jumped up & down imitating the duck's quack and hopped around like a kangaroo or a bunny (see photo below of her "being" a bunny). My little "hoi sum gor" (cantonese for "Happy Chappy"), she is. 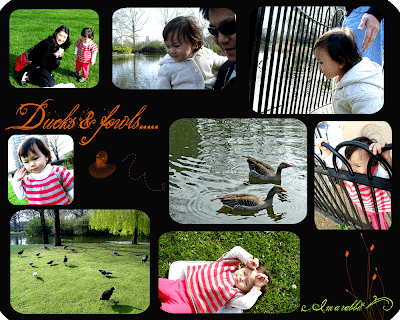 There were ducks & fowl aplenty in the park and Shean Wenn, being an animal lover (she knows most of the animals in her book, even different kinds of birds - ie she knows her owls frm her parrots) went close to have a look at duck & geese swimming in the pond. But then, suddenly the geese started to honk! She retreated and pat her chest signalling she is scared! Haha.. that was funny. I guess she can't tell from the books or telly how loud a goose can honk! We strolled around and allowed her to play in the kid's playground for awhile. And slowly walked back to the car. Overall, a very pleasant 2 hours to spend a Sunny Saturday outdoors. 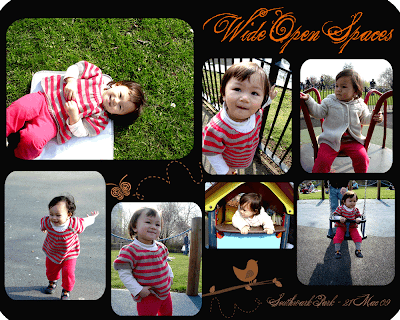 I like the Wide Open Spaces picture(s), especially the one where she is lying down enjoying the moment. She must love getting out when it is nice and warm. Your little one looked like she was really enjoying the great outdoors :) i must say, she's really quite photogenic too.